Autonomous vehicles are old news thanks to self-driving smart strollers making their way to the market. Now that self-driving cars have arrived, it makes sense that scientists put their efforts towards making anything that moves autonomous. Especially stuff that moves our babies, right?? 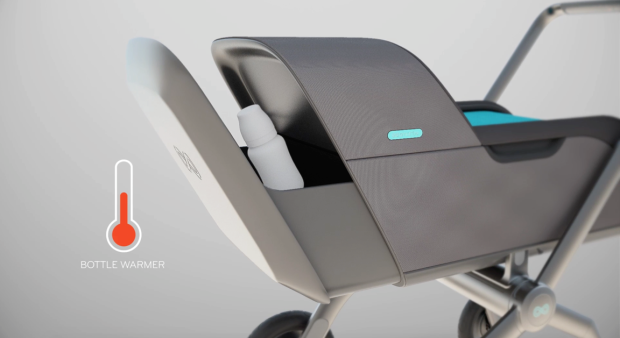 Expecting to ship in December, one company is putting the finishing touches on their self-driving smart stroller. It’s called Smartbe and it’s an “intelligent stroller” (using patent-pending technology) equipped with a variety of features to make pushing, carrying, monitoring and jogging behind our kids a little bit easier. The flagship feature of the smart stroller is the three-navigation-mode capability: manual, power assisted, and self-propelled. In manual mode the stroller is pushed without engine assistance (you know, like how those old lame ones used to work). Power assisted mode keeps the stroller under the user’s control; however there is a degree of engine assistance to help maintain momentum. The self-propelled version of the stroller keeps pace and distance with the user’s movement without human assistance or physical contact. In order to maximize stability, Smartbe has two front powered wheels equipped with smart stop technology to slow and brake the stroller automatically as needed. To help make the ride more comfortable for children, there are three retractable canopies to protect against the cold and rain, the sun’s harmful rays, and insects. Built-in air filters help to protect the child from pollution and allergens. 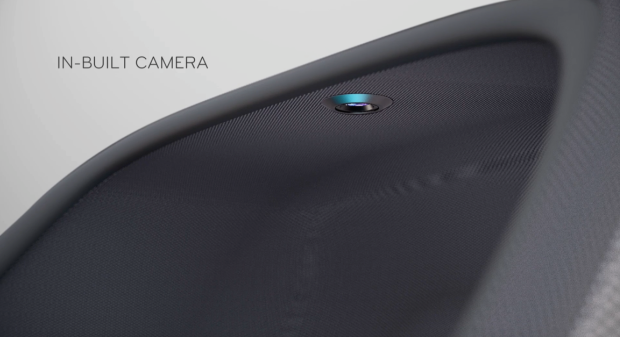 Smartbe also sports a built-in interior and exterior webcam which broadcasts a video feed to the companion smartphone app. In addition to comfort, there’s also a significant focus on safety. 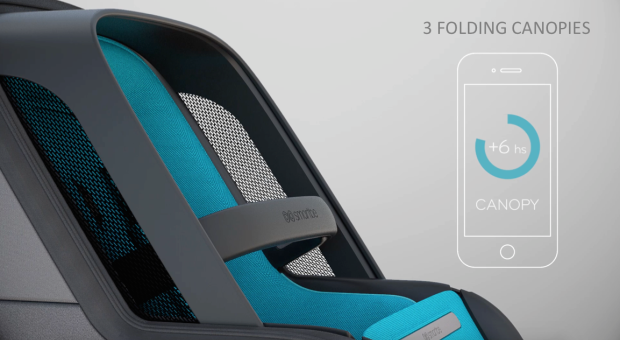 Smartbe has a built-in motion lock so that only authorized persons can unlock the stroller. There’s also an anti-theft alert so that a notice is sent to parents should the stroller move without their permission. In addition to the anti-theft measures, there’s a handful of features which turn the smart stroller into a complete nursery on wheels; cushion safety belt wrist strap, wireless music speaker, electric feeding bottle warmer, built-in rocker, and adjustable stroller frame positions are part of the repertoire. All of Smartbe’s functionality can be controlled via the built in control panel on the stroller handle or the app that will be available on iOS and Android. Smartbe’s Indiegogo campaign wrapped up this past February with over $84,000 in funding, but they’re still taking pre-orders. The Glamor version of Smartbe is $399, the multifunction Smartbe starts at $899, the power assisted version starts at $2,750, and the self-propelled version starts at $3,099. Shipping is additional for all these offerings. In addition to the stock designs, Smartbe is offered in multiple custom canvases such as camo, zebra, grey tweed and monochrome. Wow. If you buy this for your baby, we’re not sure who is getting spoiled. Nothing seems to be happening with their development and delivery, despite raising nearly 100K on Indiegogo. They’ve not updated the website in one year. Great features and benefits; questionable ‘realism’. There will always be more for a soccer mom to spend her money on 🙂 These are pretty cool, when you are thinking about the technology involved, but the price is just out of hand. More than $3,000 on a baby stroller? The baby will learn to walk faster than most consumers could pay that back. LOL, that price. Yet I still picture at least one sub division loaded with moms and these things frying all over the place! While strollers might not be the first thing I think about after the self driving car, it does make sense. I am really excited to see how and where this technology goes from here. Great post and great stroller concept, I expected that the price will be much higher for this invention but Im positively surprised. Also Im big baby stroller fan and I have a blog where I write reviews about them, I cant wait to buy one of these smart strollers for my baby.